The Size Dividers Oblong White with Black Numbers will help your retail store's customers be able to find their size of clothing quickly. 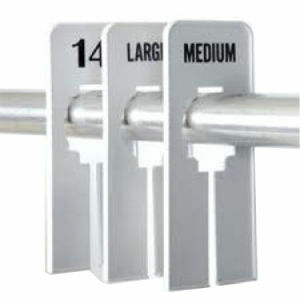 Please note the item number" 4612 blank" clothing size dividers have no printing. Overall height of each sizer is 2" x 5". Portion of the sizer that displays above the hangrod is 1 1/2".